The S&P Case-Shiller Index for the San Francisco Metro Area covers the house markets of 5 Bay Area counties, divided into 3 price tiers, each constituting one third of unit sales. Most of the San Francisco’s and Marin’s house sales are in the “high price tier”, so that is where we focus most of our attention.” The Index is published 2 months after the month in question and reflects a 3-month rolling average, so it will always reflect the market of some months ago. The Index for March 2015 was released on the last Tuesday of May. The 5 counties in our Case-Shiller Metro Statistical Area are San Francisco, Marin, San Mateo, Alameda and Contra Costa. 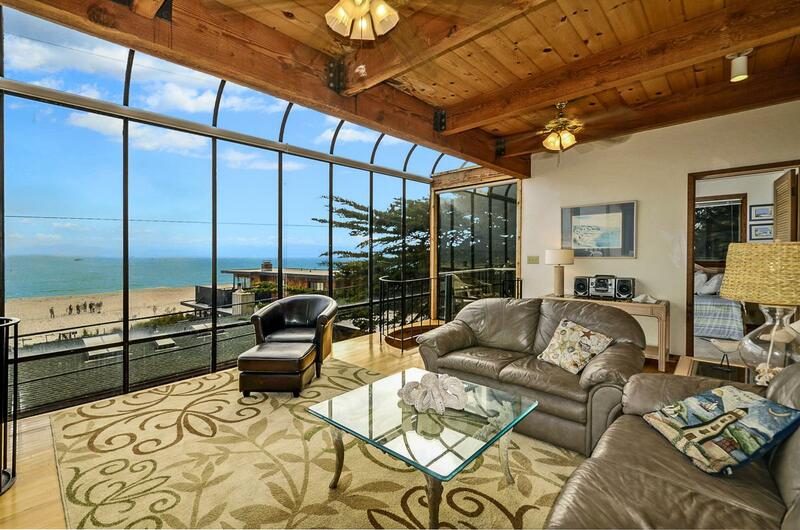 Needless to say, there are many different real estate markets found in such a broad region, and it’s probably fair to say that the city of San Francisco’s market has generally out-performed the general metro-area market. The first two charts illustrate the price recovery of the Bay Area high-price-tier home market over the past year and since 2012 began, when the market recovery really started in earnest. In 2012, 2013, 2014 and now 2015, home prices have dramatically surged in the spring (often then plateauing or even ticking down a little in the following seasons). The surges in prices that have occurred in the spring selling seasons reflect frenzied markets of huge buyer demand, historically low interest rates and extremely low inventory. In San Francisco itself, it was further exacerbated by a rapidly expanding population and the high-tech-fueled explosion of new, highly-paid employment and new wealth creation. From what we are seeing on the ground in the feverishly competitive hurly burly of deal-making, we expect further increases to show up in the April and May Index reports. Case-Shiller Index numbers all reflect home prices as compared to the home price of January 2000, which has been designated with a value of 100. Thus, a reading of 210 signifies home prices 110% above those of January 2000. It’s interesting to note that despite the different scales of their bubbles, crashes and recoveries, all three price tiers now have similar overall appreciation rates when compared to year 2000. As of March 2015, this range has narrowed to 104% to 110% over year 2000 prices. This suggests an equilibrium is being achieved across the general real estate market. Different counties, cities and neighborhoods in the Bay Area are dominated by different price tiers though, generally speaking, you will find all 3 tiers represented in different degrees in each county. Bay Area counties such as Alameda, Contra Costa, Napa, Sonoma and Solano have large percentages of their markets dominated by low-price tier homes (though, again, all tiers are represented to greater or lesser degrees). San Francisco, Marin, San Mateo and Santa Clara counties are generally mid and high-price tier markets, and sometimes very high priced indeed. Generally speaking, the higher the price, the smaller the bubble and crash, and the greater the recovery as compared to previous peak values. Smaller bubble (119% appreciation, 2000 – 2006) and crash (42% decline) than low-price tier. Strong recovery but still a little below 2006 peak. And this chart for the Noe and Eureka Valleys neighborhoods of San Francisco shows the explosive recovery seen in many of the city’s neighborhoods, pushing home values far above those of 2007. San Francisco, San Mateo and Santa Clara counties are most effected by the high-tech wealth effect on home prices. 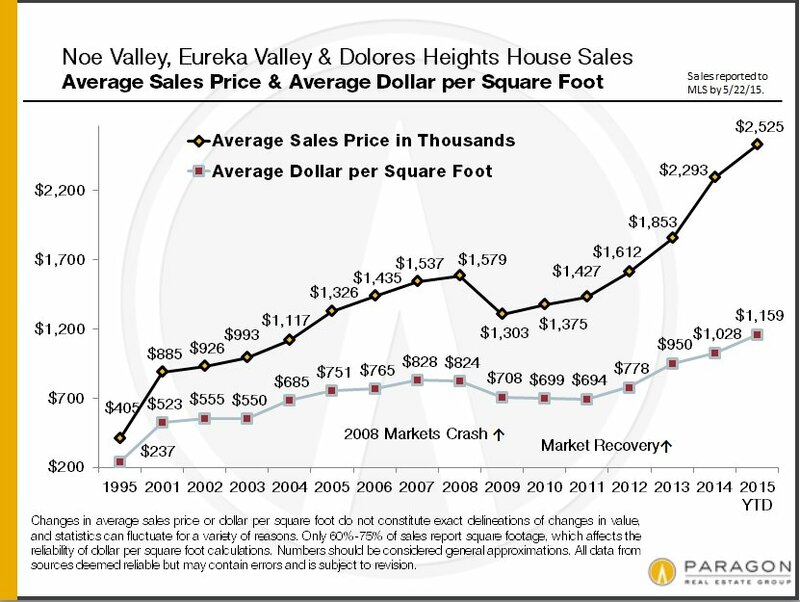 Noe and Eureka Valleys are particularly prized by this buyer segment and the effect on prices has been astonishing. This chart updates, with the last prices the medians for 2015 YTD (i.e. 1/1 – 5/21/15). This CAR Housing Affordability Index (HAI) is calculated using median price, household income, interest rates and other financial criteria to determine the percentage of local households which can afford to buy. At 14% to 15%, San Francisco, Marin and San Mateo have very low affordability readings in comparison to other parts of the country – the Index reading is now 31% for the state and 59% for the country. Affordability calculations are a complex and nuanced issue, especially in San Francisco*. However, one can’t argue with the general trend lines. When the market heats up and prices rise, affordability goes down; when the market goes into a recession, affordability rises. If affordability declines beyond a certain point, it may become an indicator of an overvalued real estate market. SF’s Index reading is still above the historic lows it hit in 2001 and 2007. Changes in interest rates can quickly and significantly affect affordability. The above chart illustrates the seasonal ebb and flow of the market as new listings come on the market and buyers react by putting properties under contract. Spring is typically the biggest selling season of the year, followed by a large spike in autumn. Market activity usually slows in summer and plunges during the winter holiday season. The two charts below are from our recently issued reports on the multi-unit building market, the first on properties of 2 to 4 units, and the second on larger apartment buildings of 5+ units. The second chart illustrates the parallels between rents and home prices in counties around the Bay Area. Regarding affordability: If someone’s choice is between paying a very high rent or buying an expensive home at today’s low interest rates and with all the tax advantages of homeownership, buying is typically the much better option financially over the longer term. But the devil is always in the details. The first chart below and the map following it depict the current boom in new-home construction and the districts where new development is clustered. The second chart illustrates the growth of the condominium segment of the city’s housing inventory via both construction and conversion. (A lot more is coming.) The new-home development situation in San Francisco is fascinating – and a fierce political issue. New home development often goes through gigantic boom and bust cycles. What complicates the issue for SF developers is that from start to finish, from creating plans for city review to completing construction, the process can easily take 4 to 6 years. Right now, both residential and commercial developers are making enormous bets on a long, sustained, up cycle in the SF economy and real estate market. New residential construction is heavily concentrated around the Market Street corridor, the Van Ness corridor just north of Market, and in the large quadrant of the city that lies to the southeast of Market. This is due to the availability of large, previously commercial/industrial-use lots that can be changed to residential use, and the zoning that allows for large – sometimes very large – projects to be constructed in these areas. Though only about 40 years old, the condo sales market in the city is now larger than the house market. And 99% of all new construction being built for sale consists of new and usually high-end condos. * A few “peculiarities” that may skew the housing affordability calculation in San Francisco are: 1) the city has an abnormally high percentage of single-resident households, 38%, which affects median household income figures, 2) unlike most counties, the majority of SF residents are tenants not owners, and the greater part of those are under rent control, and 3) the SF market is currently being fueled in no small part by large numbers of people moving into the city for very well-paid jobs. Short-term median prices may fluctuate due to a number of different factors, including seasonality, inventory available to purchase, interest rates and significant changes in the luxury and new-home segments of the market.Longer-term trends are always more meaningful than short-term ups and downs. These analyses were made in good faith with data from sources deemed reliable, but they may contain errors and are subject to revision. Statistics are generalities and how they apply to any specific property is unknown without a tailored comparative market analysis. Sales statistics of one month generally reflect offers negotiated 4 – 6 weeks earlier, i.e. they are a month or so behind what’s actually occurring in the market as buyers and sellers make deals. All numbers should be considered approximate.Please contact us with any questions or concerns.